"we very much enjoyed the breakfast choices and the lunch and dinner meals that we tried. The staff were very helpful and we loved having a b..."
Rooms, services Imola Hotel Platán Eger is welcoming all guests in Eger with 51 comfortable rooms to stay in. The hotel is offering you freshly prepared fine local meals in its restaurant every day. There is a parking space available on the spot, so in case you are arriving by car, you will be free to leave it there without any additional costs. For recreational purposes you may try the wellness services provided by the hotel, more detailed information you will find on the information sheet. If you choose one of the rooms equipped with air-conditioning, you can rest assured that you will be arriving home to a cool and pleasant room even after an exhaustive and long day (you can make sure on the information sheet of the selected room if it features air-conditioning). Wireless Internet connection (WiFi) is available at the hotel, enabling portable devices and smartphones to go online. The exact scope of services offered by Imola Hotel Platán Eger (including those for an extra fee) and the exact equipment of a room are available on the information sheet below and on the information sheet of the given rooms. Location Szépasszony Valley Eger is located 3 km away. Additional offers, payment Besides the standard reservation you can also book a special deal, the details of which you will find at the "Packages" section below. The hotel is offering the following methods to pay your reservation: cash, credit card. Arrival, opening hours The earliest check-in time is 14:00, the latest check-out time is 10:00. The personnel can speak English and Hungarian languages. The rating of Imola Hotel Platán Eger is 9.6 from the maximum 10, 1264 based on actual and valid guest ratings and reviews. "we very much enjoyed the breakfast choices and the lunch and dinner meals that we tried. 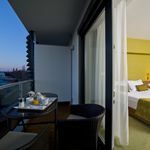 The staff were very helpful and we loved having a balcony off our room." Based on the reviews and comments of actual guests, the services of the Imola Hotel Platán Eger have received a high rating of 9.6/10.